Product prices and availability are accurate as of 2019-04-24 20:05:56 MST and are subject to change. Any price and availability information displayed on http://www.amazon.com/ at the time of purchase will apply to the purchase of this product. Block Surf racks are the industry standard. No rain gutters needed. 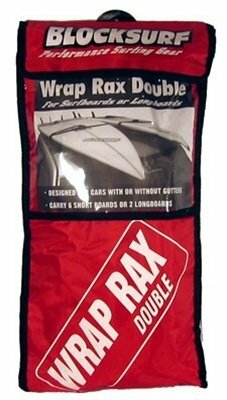 Racks wrap through vehicle, greatly increasing the security of your boards! Securely carries up to six boards. Comes with convenient carry bag. Holds 1 to 3 boards on each side safely. Will work on any vehicle. Wraps thru the car for secure hold. Easy strap down buckles.